I was somewhat surprised when I read that New Line was going to be staging a production of Jonathan Larson’s Pulitzer Prize-winning musical Rent. The surprise was not that New Line was doing the show. It was that they had never done it before. Known for their offbeat and edgier productions of musicals, New Line seems like just the right venue for this show, even though it’s taken all these years for them to produce it. Good things happen in their proper time, I guess, and it seems like that time is now, as New Line has proven with the visually striking and emotionally gripping version that is currently being presented on their stage. 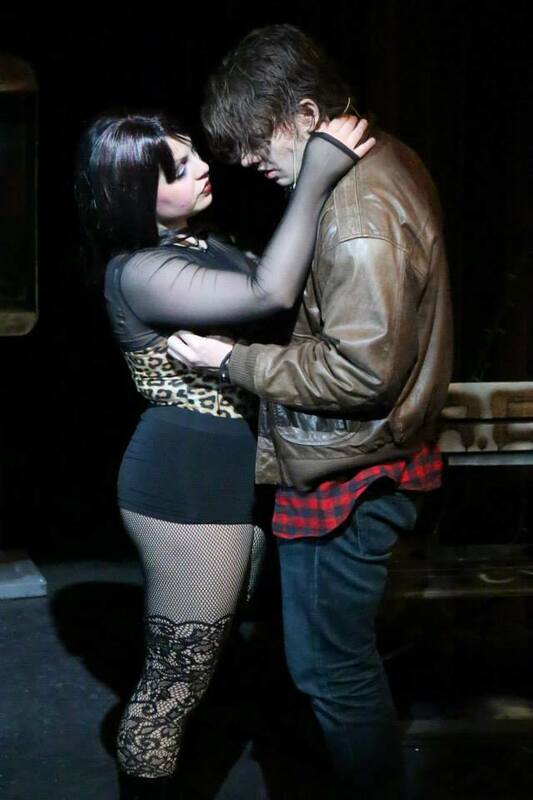 Rent is the enormously popular and critically acclaimed examination of life in New York City’s Lower East Side in the early 1990’s, inspired by Puccini’s classic opera La Boheme and its source material, the novel Scenes de La Vie de Boheme by Henri Murger. Like the earlier works, this show revolves around the lives of struggling young artists, updated to reflect the times and issues of early 90s New York, including class struggles and the AIDS epidemic. The story centers on aspiring filmmaker Mark (Jeremy Hyatt) and his roommate, the melancholy, HIV-afflicted ex-junkie rock musician Roger (Evan Fornachon), and their diverse group of young Bohemian friends. There’s Mark’s ex-girlfriend, performance artist Maureen (Sarah Porter) and her current girlfriend, Ivy-league educated lawyer Joanne (Cody LaShea), who experience a somewhat volatile relationship. There’s also Mimi (Anna Skidis), a young dancer who struggles with drug addiction and HIV, and who is drawn to Roger, as well as sometime college professor Collins (Marshall Jennings), who develops a romance with the charismatic drag queen street performer Angel (Luke Steingruby). In contrast to the young Bohemians is the newly wealthy Benny (Shawn Bowers), Mark and Roger’s former roommate who married a millionaire’s daughter and is now their landlord. Throughout the story, the various romantic entanglements are woven throughout the story that also focuses on issues of artistic expression, integrity vs. commercialism, and the struggle against economic and social injustice in the city. This is an intense show, with moments of sadness and angst, as well as moments of love, joy and hope, and that full range of emotion is well-represented in this vibrant production. I did notice in the performance I saw that it took a little bit of time for the show to really get moving, but once it did (with Hyatt and LaShea’s highly charged performance of “Tango; Maureen” ), it kept getting better and better. The show’s better-known songs like the raucous “La Vie Boheme” and the poignant “Seasons of Love” are well represented here along with the rest of the memorable score, sung by the glorious voices of New Line’s impeccable ensemble. 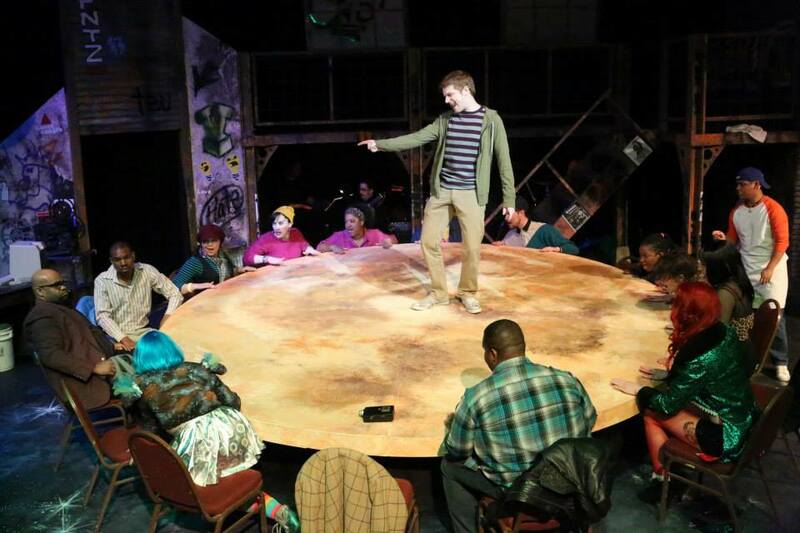 The leading cast is superb as well, especially Hyatt as a particularly energetic and sympathetic Mark, as well as Skidis’s vulnerable Mimi and Porter’s fiery and confrontational Maureen, bringing laughs and attitude to “Over the Moon”, and sharing the spotlight with the equally strong LaShea in their memorable duet “Take Me Or Leave Me”. Steingruby brings a lot of charm and sweetness to Angel, particularly in his scenes with Jennings. Fornachon, as the moody Roger, has a great rock singing voice and looks the part, working well in his scenes with Skidis and Hyatt, but I also find myself wishing he would hold his head up more and wouldn’t sing to the floor as much. Bowers is also convincing as the increasingly conflicted Benny. I was particularly struck by the excellent voices of the entire company, but this shouldn’t have surprised me since the singing at New Line is always top-notch. I loved all the attention to detail in this visually stunning production. Set and lighting designer Rob Lippert, costume designers Porter and Marcy Wiegert, props master Alsion Helmer and the entire design team have created a look that is unique to this production and that brings the audience into the world of this Bohemian New York neighborhood in the 1990’s, with characteristic elements such as a vintage pay phone, clunky cell phones, and Mark’s handheld movie camera, and painted with authentic-looking graffiti. It’s a multilevel set with all the performance areas put to full use, including the perimeter areas and the audience. The centerpiece is a giant round table/platform that is painted to resemble the moon, which makes it an ideal stage for Maureen’s “Over The Moon” performance, as well as serving as a large cafe table for “La Vie Boheme” and as a way to set off the ensemble in the “Life Support” group scene. It’s a bold setting for a bold production, and it leaves a lasting impression. Shockingly enough considering how popular and acclaimed this show is, I had never seen it live before. I had only previously watched the filmed version of the Broadway production that was released in 2009, in addition to having heard many of the songs on various occasions. I enjoyed that DVD, but I’m also glad directors Scott Miller and Mike Dowdy have chosen to follow their own vision for the show. New Line’s version is full of youth and energy. It’s also staged with a sense of immediacy that brings a lot of life to the show. Although the passage of time has turned Rent into something of a period piece, New Line doesn’t treat it that way, and that’s as it should be. It’s an iconic show made achingly real, with all the truth and energy brought along with its humanity. It may have taken New Line many years to finally do this show, but this production is well worth that wait. There are days I wish St. Louis were closer.